It’s an exciting time for me as the culmination of 2 years of HDR field testing and processing is released in my new book: “Complete Guide to HDR Digital Photography.” The book is written for photographers who want to learn HDR and then progress to advanced techniques in the field and computer processing. Categories of scenes are explained to help the photographer recognize when a single image will suffice verses the need for an expanded image set to capture an extremely high dynamic range. Many HDR topics are explained in detail including camera setup, HDR software comparison, advanced image analysis, post-processing HDR and single-image tone mapping. Sections of the book also include HDR for architecture and panorama photography. The HDR book also includes a newly introduced technique of using flash with HDR, called Flash Merging. 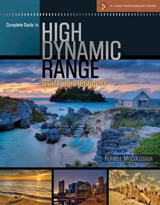 “Complete Guide to HDR Digital Photography” also includes 5 contributing HDR artists’. The artists are internationally recognized for their work in HDR and can be seen on the Flickr photo site. They include the international traveler Trey Ratcliff, Asmundur Thorkelsson from Iceland, Valerio Pandolfi from Italy, John Adams from Florida, and Domingo Leiva from Spain. Congratulations on the book. I can’t wait to see it. I bought your book and I love it. Thank you so much your time and effort putting all essentials toghether. I have question for you. The new Pentax DSLR K20D and K200D have a bulit-in HDR function which shoot 3 explosures and merge them within the camera processing. I don’t have all the detail, but it sounds like very good. What do you think? I want to get this camera. It save a lot of time for HDR-post-processing.